Tonight I attended a National Geographic talk about birds of paradise. The talk (by a Nat Geo photographer and ornithologist) was so informative, and the photos were incredible! It made me realize how little time I’ve taken to photograph birds. Maybe I just haven’t had the patience for it, but I want to be more intentional about it in the future. Here’s one of my few shots…nothing in comparison to what I saw tonight. A cardinal seen during a Kansas winter, 2012. While I don’t doubt that the National Geographic photos were amazing, I love this shot. I dream of having the equipment and talent to capture a red bird this well, and I really love the partial color. Nice! Why, thank you! I bet you and your camera could capture a similar photo. Luckily he just stayed in that spot eating for awhile, so I had several tries before I got one or two shots in focus. I was actually inside shooting through glass. Beautiful photo! 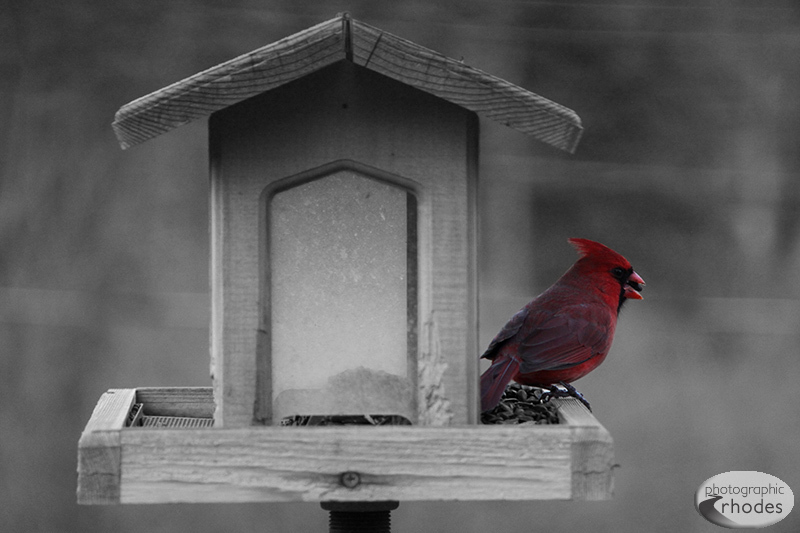 I love seeing the Cardinals during the winter, they are so bright and beautiful! Nice work! Thank you, and thanks for stopping by my blog!